The award-winning barbecue joint, Q-BBQ recently opened its first downtown Chicago location. Q-BBQ already has locations in Naperville and La Grange, but now adds a Lakeview location on Diversey to its offering. The folks at Q take their barbecue very seriously, so much so that they were awarded a coveted Michelin Bib Gourmand award two years in a row (2013 & 2014). As a city dweller that hadn't tried their 'cue, I was pumped to check out the new Lakeview spot. The restaurant features a range of barbecue inspiration from the Carolinas, Texas, and Tennessee. The huge menu offers something for everyone with meats including ribs, wings, brisket, and pork, as well as a selection of salads, sandwiches, and sides. All meats are smoked in-house and all sauces and sides are made from scratch. The BF and I stopped by on a Thursday night and the place was getting busier by the minute. After browsing the menu on the wall and ordering at the counter, you're given a number and your food is delivered piping hot. To get a good feel for all the meats Q smokes in house, we decided to order the Papa Q Platter. This massive plate of meat includes every meat on Q's menu: spicy and regular wings, burnt ends, sliced turkey, brisket, pork, chicken and sausage. It was a meat feast! Q is known for their burnt ends so it was no surprise these ended up being my favorite. I also loved the spicy wings which were coated in a sweet rub. The turkey was surprisingly delicious and not something I'd normally order so I'm glad I tried it. The pork and brisket were good but I felt the chicken was a bit on the dry side. Next time, I'm definitely getting a full order of those melt-in-your-mouth burnt ends! Q also has an impressive selection of craft beers that are perfectly paired with its barbecue. 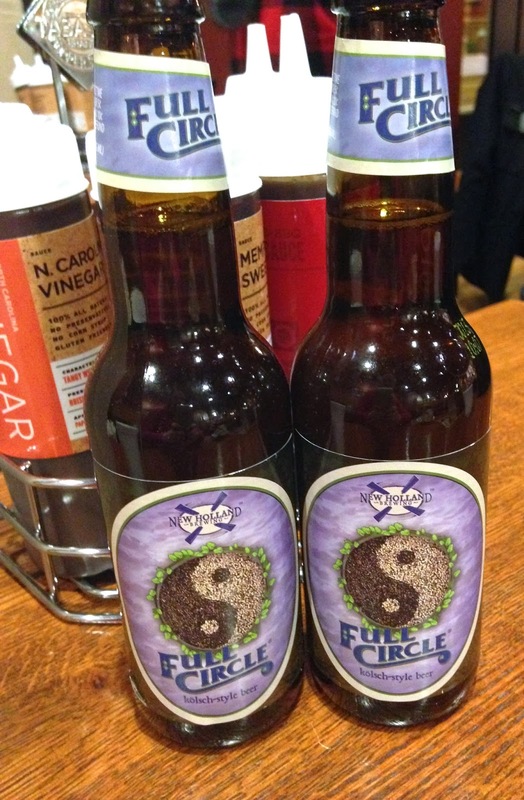 The BF and I chose New Holland Brewing's Full Circle kolsch-style beer to wash down our 'cue. For our side dishes (not that we didn't already have enough food!) we tried the MacQroni, fresh cut fries, and QPups. The mac was topped with Cheez-Its which added a salty crunch to the creamy mac, but I felt the cheesy sauce could have had more of a punch. All entrees are served with QPups, Q's version of hush puppies. These were super crispy, not too greasy, and had a slightly sweet flavor. I loved using them to dip in each of Q's homemade barbecue sauces! Q-BBQ is a great addition to the Lakeview neighborhood and proves it has what it takes to create some of the best 'cue in the city. Not to mention, the staff is super friendly and eager to help ensure your meal is perfect. Check out Q-BBQ's newest location in Lakeview, or stop by their Naperville or La Grange restaurants! Note: My meal at Q BBQ was complimentary, however, opinions expressed herein are my own.